It is reported that malaria killed nearly 300,000 people and caused over 200 million fever cases in 2015 alone. With this burden of disease comes an associated economic burden, exacerbated by the fact that it predominantly occurs in some of the poorest regions of the world, trapping many in a helpless cycle of disease and poverty. Fortunately, there has been increased funding towards control over the last two decades. Malaria hotspots are commonly observed within villages and counties, and likely fuel transmission to the rest of the community. The effectiveness of targeted control on hotspots depends on the patterns of parasite mixing within hotspots and the interaction between these parasites and those in the surrounding community. Studies show that some mosquitoes have “site fidelity”, meaning that they feed in the same homesteads and often don’t fly very far. This might mean that parasites don’t mix to high levels, and targeted interventions would reduce transmission in the targeted area but have little impact on the wider community. In this study, we used a genetic approach to study the rate and spatial extent of P. falciparum mixing from human samples in areas with different malaria transmission intensities. 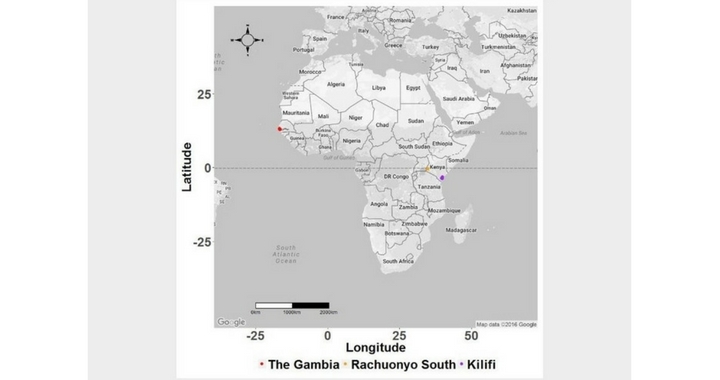 We studied P. falciparum parasites from The Gambia (an area of low transmission), Kilifi, coastal Kenya (a site of moderate transmission) and Rachuonyo, western Kenya (a site of moderate-high transmission). We selected 276 positions with single base changes (SNPs) in the parasite genome and typed them on the Sequenom genotyping platform. We then counted the number of SNP differences between parasite pairs and studied the geographic distribution of parasite sub-populations using, among others, measures of spatial autocorrelation. These are based on the principle that parasites found closer to each other in geographical space tend to be more genetically similar due to higher frequency of mixing compared to those found further apart. Since free movement is a pre-requisite to parasite mixing, we examined each site for barriers to parasite movement, by dividing the geographical space into grids/pixels and analysing the level of genetic differences between parasite pairs separated by individual grids, with the idea that if a location acts as a barrier to parasite mixing, e.g. a creek that people from opposite sides can’t cross, then parasites on either side of it would have more genetic differences between them. Conversely, geographical regions acting as “gateways” to parasite movement would be characterised by parasites with fewer SNP differences between them, as these regions would allow parasite movement and, subsequently, mixing. Parasites were highly mixed, both in time and space, with autocorrelation over relatively short distances and limited local clustering of genetically distinct sub-populations. Time had a strong antagonistic effect on the variation of parasites over distance such that within a relatively short time, distance was no longer predictive of parasite relatedness. We detected no barriers to parasite movement in any of the sites. This indicates that parasites move freely within the study areas. If parasites mix freely, as suggested by our data, the impact of hotspot-targeted interventions may affect community-wide malaria transmission. This assumes that hotspots can be detected, are stable in time and the spread of parasite populations indeed primarily occurs from hotspots to the surrounding community. The idea of fast-track publishing was enticing. We had spent nearly six months waiting for a second round of reviewer comments from another well-known open-access journal and had become frustrated with the editorial process. Additionally, we felt assured of a fair assessment of our work, as reviewer comments would be published alongside the article. We also liked the idea of the article being immediately available and citeable, even while under review, and that the platform provides an opportunity for revising the work after publication. This means that the information is immediately available to the scientific community and provides a reference point for similar studies. We were already in the process of sharing our data with a modelling group interested in secondary analysis, and had experienced difficulties with another institution requiring documentation and safe-guards regarding the data sharing. Making our data publicly available immediately circumvented these difficulties and the group have begun their analysis unhindered. The data can also be used to answer new questions not covered by the current study, in addition to opening channels of collaboration between us and others interested in similar work. Irene Omedo is a graduate student with the Open University, UK. She has a BSc in Biochemistry and a Masters in molecular biology from the University of Nairobi. She is undertaking her research studies at the KEMRI-Wellcome Trust Collaborative Research Programme, in Kilifi, Kenya, working in collaboration with Prof. Dominic Kwiatkowski’s lab at the Wellcome Trust Centre for Human genetics, University of Oxford. She is interested in the application of molecular epidemiology in routine surveillance of diseases, and is currently working on mapping malaria hotspots to guide targeted intervention programmes in Kenya. Philip Bejon first came to Kilifi in 2002 to conduct Phase I and II clinical trials of a candidate malaria vaccine based on viral vectors. I returned to the University of Oxford in 2006 to complete specialist clinical training as a clinical lecturer, and then was appointed as a senior fellow in the NIHR Oxford Biomedical Research Centre. These posts allowed me to remain active in malaria research, leading further trials of GSK’s candidate malaria vaccine “RTS,S”, and as a member of the Malaria Vectored Vaccine Consortium funded to test viral vectored malaria vaccines in several sites in Africa including Kilifi. An MRC Clinician-Scientist Fellowship allowed me to return to be resident full-time in Kilifi in 2013, working on spatial epidemiology of malaria with an interest in hotspots, and I became Executive Director of the KEMRI-Wellcome Trust Research Programme in September 2014.